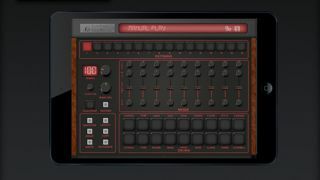 The original LM-1 was released in 1980.
iOS drum machines are Elliot Garage's stock in trade, and the company has added another one to its roster in the shape of the EGLM1. Designed to emulated the iconic Linn LM-1 drum machine, this enables you to create up to 16 patterns of variable length. Patterns can be stitched together to form songs, while other features include swing and tap tempo. Parameters for all the 'kit' pieces can be automated. Naturally, there's support for Audiobus and Inter App Audio (Korg Wist is catered for, too) and you can export patterns to iTunes or share them using AudioCopy. The EGLM1 is available now from the Apple App Store priced at £1.99/$2.99.